Last year's hay, originally uploaded by jahansell. It's been cloudy and chilly the last few days - that warm sun from last weekend was just a tease. These haybales are from last summer, I suppose. Wow. 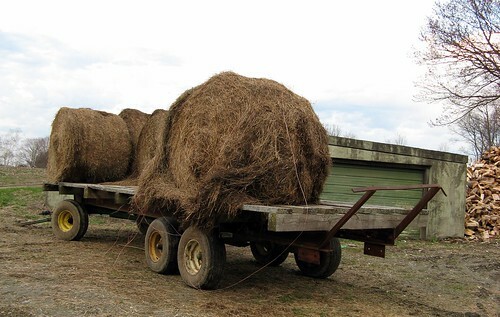 When I was young we used to use pitchforks, called, "hayforks," to pitch hay in the field on hay wagons that horses pulled into the barn and it was pulled off onto the floor. Then a giant hook came down and picked up a bunch and a rope pulled by a horse pulled the hook full up to the ridge and there it connected to a track that allowed the load to slide over to the side of the barn where the man yanked on the rope and released the load of hay into the "hay mow." Lots of memories from an old man who lived it.